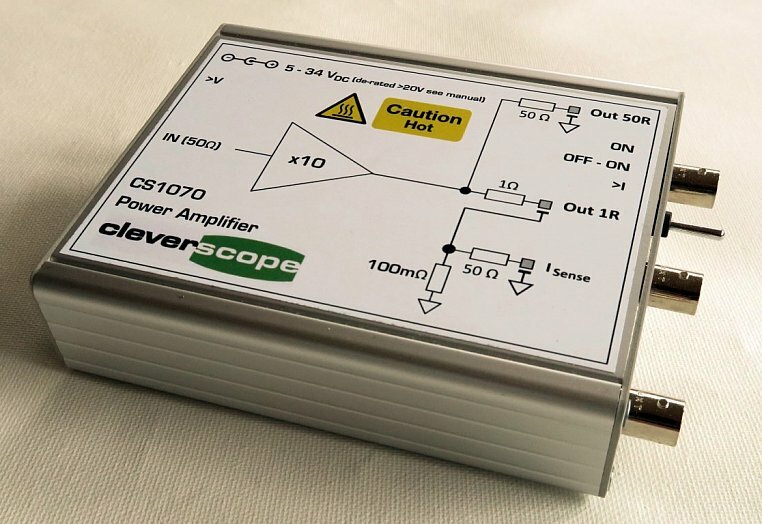 The CS1070 Power Amplifier is used to amplify the output of the CS700A or CS701 signal generators. The 52 MHz bandwidth amplifier can swing 36Vpp with an output current up to 1A continuous. 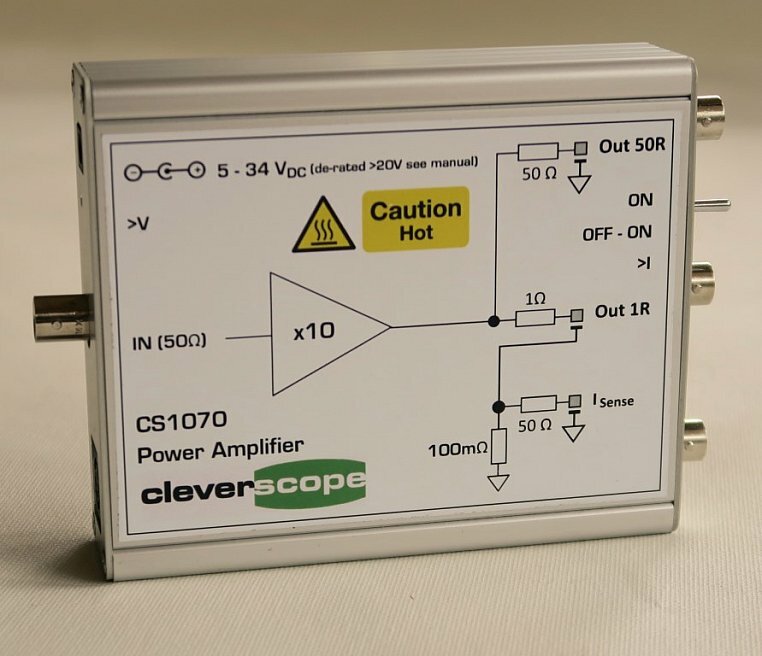 The CS1070 includes an internal inverting power supply to provide the negative rail, simplifying power supply requirements. The gain is fixed at x10 (20dB). The output voltage range is ±5V to ±18V and asymmetrical to +31, -5V for PSRR measurements right up to 30V as the input supply increases past 20V. We also have an Application note available for you to download. Power Supply Range: 5 – 34 VDC, 1 Amp minimum. Over voltage protection: 34 to 60 VDC. Reverse protection: 0 to -60 VDC. Power Supply Connector:	 2.1 or 2.5mm ID, 5.5mm OD, center +Ve. Power Supply Included: Wall adaptor with US, UK, EU plugs. Input: 90-264 VAC, 47-63 Hz. Output: 18 VDC, 1.33 Amp, 2.1x5.5mm DC Jack. Power Supply Cable Included: DC Jack with 1m cable terminated in 4mm banana plugs for use with bench power supply. Amp Enable Switch: Down = Amp Enable, Up = Amp Disable. LED Indicators: Over Voltage, Over Current, Amp On.